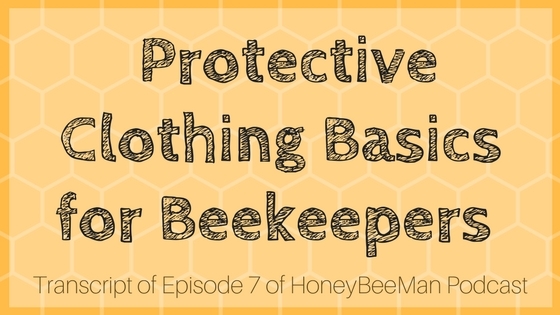 Today we’re going to talk about protective clothing for the beekeeper. There are really two main things you need as a beekeeper if you want to protect yourself. You need a good pair of gloves and you need a veil. Those are the main items. There are all kinds of variations about how to get there with a good veil and a good pair of gloves. Let’s talk first about the gloves. If you go to the beekeeping trade magazines, the companies who sell the protective gear, they sell many different types of gloves. They sell cloth gloves that are just a heavy canvas gloves. They sell cloth gloves with rubber coating on the outside, which is thick enough that the bees can’t sting through that. They sell leather gloves. They sell pigskin gloves. There are all kinds of different gloves available for beekeepers. I’ve tried just about everything. The cloth gloves, once they get worn down and you’ve really broken them in, they get dirty and sweaty and the cloth tends to stick to your hands pretty bad, especially when you’re sweating a lot. What happens is the bees will sting right through that cloth. The bees tend to find the tender areas. If you don’t want to get stung, those cloth gloves are going to wear and you’re definitely going to get stung. Now, the sting through the glove doesn’t hurt quite as bad. It’s more like an irritation than it is a really hard sting. Anyway, if you really don’t want to get stung, those cloth gloves are probably not your best bet. As far as cost, they’re pretty reasonable, they’re about the lowest cost glove you can get. The next thing we’ll talk about is the same thing, except cloth gloves that have a rubber coating on the outside. That rubber coating has a nice texture to it so that you can still pick things up and so forth. Those gloves are pretty nice. The bees do not sting through those gloves. The rubber coating tends to break down over time, so that’s kind of a nuisance. The bees don’t really sting through it, but it will tend to crack between your fingers. That’s okay. The thing that I didn’t like about the rubber coated gloves was they tend to get hot and sweaty inside the glove. The rubber doesn’t allow your hands to breathe, so they get pretty stinky and they’re hard to clean. The only thing I’ve found to do is just throw them in the laundry once in awhile, and then they’re hard to dry out afterwards. They have the long arm covers on them and you can’t seem to get that dried out. The next option is leather gloves. Leather gloves are ideal for beekeepers, in my opinion. I prefer the leather glove. They are kind of pricey, they’re about the most expensive variety, but I feel like they’re going to last longer and they’re probably worth it. I’ve not been stung too much through the leather gloves. My bees have been pretty gentle since I started using the leather gloves, so it’s kind of hard to tell. I wouldn’t want to guarantee that you’re not going to get stung through the leather, but I can tell you that I haven’t been stung through the leather yet. I’m sure it’s going to happen, but it just hasn’t yet. I’ve actually found that a pair of leather welder’s gloves works pretty nicely. They have about a four inch cuff on them and if you’re wearing long sleeve bee jacket or bee coveralls, that four inch cuff is enough to cover your wrist and basically just string that glove out over top of your jacket to prevent the bees from getting in around your wrists. Those are available at a tractor supply or farm and fleet stores and those are only about $13 to $15 for a pair of leather welding gloves with a cuff. I think those work pretty nice, but you can also buy the leather gloves through the bee supply companies. That’s about it on gloves. My preference is the leather gloves. Next, let’s talk about the beekeeper’s veil. The veils come either attached to a suit or not attached to a suit. Many different veils include kind of a built-in helmet and then other veils you have to actually buy a helmet separately. There are various different types of suits. Some of these suits are like a pullover jacket and the veil is actually attached to the pullover jacket with a zipper. Those are what I prefer. Those are easy to get into and out of. You just slip the whole entire thing over your head. The only drawback to those pullover jackets is that when you’re taking the jacket off the bees can often get you around your waist, because when you pull the jacket up it kind of lifts your shirt up a little bit around your midsection. If you still have bees flying around you, you may get stung as you’re trying to take this thing off. You just have to be careful with that. The best thing that I’ve found is to stand behind the truck, away from the bees, so they don’t know where you’re at, and then go ahead and pull your bee suit off and usually you’re okay. As long as you don’t hear any bees flying around your head before you start disrobing your veil, you’re in good shape. The pullover jackets are pretty popular and they’re pretty reasonably priced. You can buy those for about $34 and up. You might even be able to get them cheaper than that. There’s also a commercial pullover that has the veil and all and those start at around $60. You can get a zippered jacket that is zippered in the front, they start in price at about $40. You can even get a shoulder veil, which is basically a giant veil that covers your shoulders and drops down. One of these veils is actually the mesh material that goes right down to your waist. Those run about $20. You can actually get just a veil. BetterBee sells one called an Alexander Veil that is just a veil that you wear around your head and it goes around your neck and protects your neck and you put that over a shirt. You can just wear a white shirt, long sleeved, preferably with a t-shirt underneath it just to give you enough thickness that the bees can’t sting through the shirt, then a good pair of gloves and a veil. A lot of guys work that way, they don’t like to wear the jackets. The bottom line is it depends on how much you want to get stung. You definitely need the veil. You probably definitely want to wear the gloves. As far as the shirt and the jacket or coveralls, it really depends on how mean your bees are. If you have some bees that are mean or if you’re a new beekeeper, I would suggest you go ahead and get the full jacket, full pants that cover your legs and everything. That way you’re a little more confident about working the bees. After you’ve worked the bees awhile, you probably will feel like you don’t need the full jacket and you may decide to go ahead and work the bees without a jacket or without the pants coveralls and you’ll feel confident enough that you know how mean your bees are going to be. Typically, brand new bees are pretty friendly and hopefully you won’t have that problem. I have seen bees that when you crack the top they literally just come out and attack. If you do have meaner bees like that, then you want to make sure that you’re suited up very well. Once you have 200 bees flying around your head, you can’t really get away from them. We’ll have another lesson talking about how to get away from honeybees if you should be attacked. If you’re not properly protected, there are things that you can do to get away from them. You don’t want to be attacked by hundreds or thousands of bees and not have an escape plan, so we’ll have another lesson about that another day. Hopefully, this lesson gives you a good idea of what type of equipment you’ll need as far as veils and gloves. You can work the bees directly with proper suits. I’ve seen bees go after somebody that is forty or fifty away that is not properly dressed. You just never know. If the bees get a little irritated, they may go after somebody that is a bystander. It just depends on how friendly your bees are. Hopefully, yours are not the aggressive type and you can work them with very little equipment in the way of protective gear. You definitely want the veil, you definitely don’t want an attack of bees on your head or neck. You just never know until you get the hive opened what kind of reaction you’re going to get out of the bees. It’s better to be safe than sorry.